The best way to describe Andres Medina's career is multicultural. A native of Venezuela, Andres spent the last 15 years in Washington, D.C. before coming to Madison to run an Italian restaurant. But no matter which capital or nation he calls home, he and his co-workers speak the same language. "To me, working in the service industry is a lifestyle, not a job," says Andres. "We are like a big tribe with our own language, code of ethics...and full of personalities. The job can be intense and requires a strong sense of self and work ethic. A special few can understand the sacrifice, the long hours and the constant search for excellence the job requires. I personally enjoy spending my days surrounded by all my co-workers, working as a team toward the same goals. This job has become a part of who I am and I am proud to work alongside people that share the same passions." "My favorite thing about restaurants is the constant interaction with people and how you get to taste a little bit of other countries and cultures without having to travel," says the (ironically) well-traveled Andres. "It is the fusion of cultures, flavors, ideas and personalities that make every restaurant a unique place." When Andres first moved to D.C. in 2001, his best friend helped him get a job as a food runner in a local restaurant, where he developed his passion. "After years of holding various jobs in the D.C. restaurant industry, I ultimately landed at Mike Isabella Concepts, one of the fastest-growing restaurant groups in the D.C. area, led by the former Top Chef participant," says Andres. "During my three years with the company I held several managerial positions while also opening several new restaurants and concepts each year. On the rare occasion when we were not opening new restaurants, I focused on broadening my wine knowledge and eventually received an Advanced Certification from the Court of Master Sommeliers." 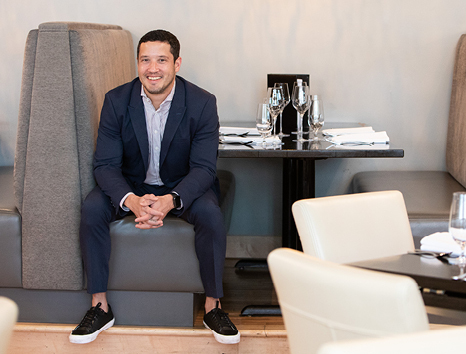 That expert wine knowledge serves Andres well at Cento, and his experience with developing new restaurants and concepts makes him a natural for Food Fight. In fact, he's constantly exploring new ideas in different places. "I love spending time with my girlfriend; she is my biggest supporter and we love going out to eat and drink or staying in to cook at home," says Andres. "When we aren't out trying the newest restaurant or bar in Madison, Chicago or D.C., you can find us on the lake or hiking with our dog, Opie."